Perfect as a decoration for a baby's nursery or for Easter, this sweet little bunny pattern is suitable for any crocheter with basic experience. This miniature crocheted bunny is an easy project that you can whip up quickly to decorate a shelf or attach to a holiday wreath. This cute little bunny is easy to stitch for the beginning crocheter. All of the body parts are worked separately, then attached to the body. You can make multiple bunnies quickly using an assembly line method. The approximate size of the finished bunny is 5 ½ inches tall while sitting. To download the free pattern, click on the pattern image and print it out. For more information on downloading, try these helpful tips. Click here to down the pattern. This bunny is not intended to be used as a toy. It is unsuitable for babies or small children. The beads used on the face could become a choking hazard. If you want to make it safer for young children, consider embroidering the details instead of using beads. Changing the hook size and the thickness of the yarn used is a simple way to alter the size. Substitute old sewing snaps for the beads on the eyes and nose to create a unique, old fashioned appearance. Sew flat buttons over the stitched arm and leg joints to embellish and customize the bunny. Voodoo Maggie has a cute bunny applique that you could also use as an ornament, magnet or pin. Make several and attach them to ribbon for a garland. This pattern is suitable for the new to intermediate crocheter. Crochet this adorable bunny hat with matching diaper cover from Repeat Crafter Me as a photography prop for Easter or spring photo sessions. While the pattern is easy to follow, multiple size options make this pattern more suitable for a crocheter with intermediate crochet skills. Try these bunny appliques from Love the Blue Bird. These sweet bunnies have a strong resemblance to bunny peeps. Just like you can't eat just one peep, you won't be able to make just one of these bunnies. This is a very easy pattern. Snuggle your child up in this filet crochet blanket from Red Heart. 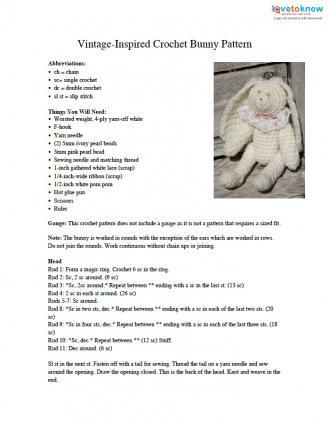 This pattern does have a diagram to follow, but it is suitable for a beginner to crochet. 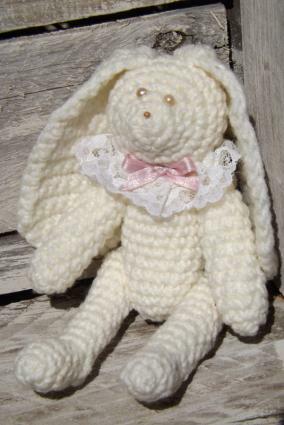 Crocheting gifts like this sweet bunny allows you to present the recipients with unique, customized items they will cherish for years. New crocheters, as well as those with tons of hooking experience, will feel a sense of accomplishment and pride when they make this cute little bunny for a family member or friend.